You've driven your vehicle to the emissions test station to have it tested, but your vehicle was rejected because it was "Not Ready." What exactly does "Not Ready" mean? It means your Onboard Diagnostic System (OBD II) has NOT completed all of its self-test monitors that keep an eye on the performance of your emissions control systems. Depending on the year, make and model of your vehicle, there may be half a dozen or more OBD monitors that must have completed. A single or multiple "NOT READY" indications will prevent your vehicle from passing the emissions inspection. To pass an OBD II plug-in emissions inspection test, all of the OBD monitors must have run and successfully completed with no faults found. This tells the emissions test computer that your vehicle is performing within emissions limits for your year, make and model, and that your vehicle is in compliance with the applicable emissions laws, and that your vehicle is not polluting. Misfire Monitoring to detect ignition and fuel related misfires that may cause emissions to increase and/or damage to the catalytic converter. Fuel System Monitoring to detect changes in fuel mixture that may cause emissions to increase. Comprehensive Component Monitoring to detect any major faults in engine sensors that may cause emissions to increase. The OBD monitors that only run under certain conditions include the EVAP monitor, HEGO monitor (Heated Exhaust Gas Oxygen sensor), and the Catalyst Efficiency monitor. the Catalyst, EVAP and HEGO oxygen sensor monitors. The EVAP (Evaporative Emission Control System) monitor checks for fuel vapor leaks (including a loose or missing gas cap). As a rule, the EVAP monitor only runs when certain conditions have been met. If these conditions have not been met since the last time the monitor ran, or since the last time the battery was disconnected, or since the last time fault codes were cleared from the PCM memory, the EVAP monitor will NOT be ready. The requirements for running the EVAP monitor vary depending on the year, make and model of your vehicle. Generally speaking, the fuel tank must be 1/4 to 3/4 full because a near empty tank or a full tank can affect the accuracy of the EVAP self-test. The ambient outside temperature must not be too hot (above 95 degrees) to too cold (below 30 degrees) because this affects fuel volatility and the amount of vapor inside the tank. The vehicle must also have sit overnight or for 8 hours or more without being driven. On some vehicles, the EVAP monitor runs when the vehicle has been cruising on the highway at light throttle at a speed of 45 to 65 mph for at least 10 minutes or more. All of the components in the EVAP control system must also be functioning normally. The presence of any EVAP-related fault codes will prevent the EVAP monitor from running. The EVAP monitor checks for vapor leaks by applying vacuum or pressure to the fuel tank, vapor lines and charcoal canister. If it detects no airflow when the EVAP canister purge valve is opened, or it detects a leak that equals or exceeds the amount of air that would pass through a hole 0.040 inches in diameter (0.020 inches for 2000 and up model year vehicles), it logs a trouble code in the P0440 to P0457 range. Ford: With fuel tank one half to three-quarters full, cruise at 45 to 65 mph for 10 minutes. Avoid sharp turns and hills during this period. Chrysler: There are two-parts to this test. The first part runs after idling for five minutes, then driving at 30 to 45 mph for two minutes (fuel tank must be half to 85 percent full). The second part runs after the vehicle has sit for 8 or more hours (cold soak) without being driven. Start the engine and idle for four minutes, then drive in stop-and-go traffic for five minutes using smooth accelerations and decelerations. Stop and idle for 4 minutes. The EVAP monitor should be complete. The Heated Exhaust Gas Oxygen sensor monitor makes sure the oxygen sensors are functioning properly and are operating within their normal range. The monitor runs after the engine has reached normal operating temperature, and the vehicle is cruising at a specified speed for a specified length of time. This monitor will not run if there are any faults in the oxygen sensor heater circuit, if there are any pending oxygen sensor codes, or the engine coolant or vehicle speed sensors are not functioning normally. If the HEGO monitor is NOT ready, it will prevent the catalyst efficiency monitor from running, causing yet another Not Ready to be tallied against you! Ford: The HEGO monitor should run when the engine has reached normal operating temperature, the inlet air temperature is between 40 and 100 degrees F, and the vehicle is cruising at a steady 40 mph for four minutes. GM: GM uses a two-part HEGO monitor. The first part of the HEGO monitor runs after idling the engine for two and a half minutes with the A/C and rear defroster on. This checks the O2 heater circuit. After this, turn the A/C and defroster off, then accelerate at halt throttle to 5 mph and hold at a steady 55 mph for three minutes. This will complete the second half of the HEGO monitor that checks the responsiveness of the O2 sensors. Chrysler: Idle for five minutes (to reach closed loop operation). Then drive at a steady vehicle speed above 25 mph for two minutes. Stop and idle for 30 seconds. Then smoothly accelerate to 30 to 40 mph. Repeat the last two steps five times. Toyota: The HEGO monitor should run after idling the engine for nine minutes, then driving at a steady 25 mph for two minutes. The Catalyst Efficiency Monitor verifies the catalytic converter is operating at high enough efficiency to keep exhaust emissions within acceptable limits. 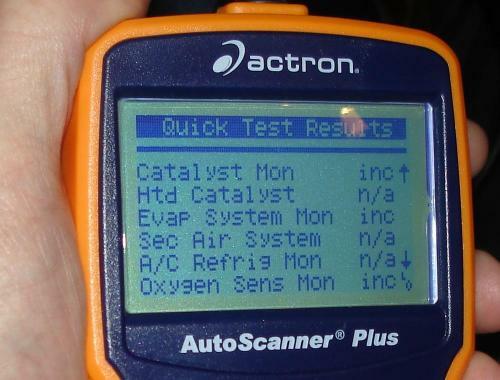 The monitor compares the signals from the upstream and downstream oxygen sensors to monitor the operation of the catalytic converter. If catalyst efficiency has dropped below a certain threshold, this monitor will set a converter fault code (P0420 and/or P0-439) and turn on the Check Engine light. As a rule, if converter conversion efficiency drops below 80 percent for any pollutant (carbon monoxide, hydrocarbons or oxides of nitrogen), the vehicle may be polluting, causing a code to set. On late model Low Emission Vehicles (LEV) and Ultra Low Emission Vehicles (ULEV), there's even less margin for error. The catalyst monitor may set a code if converter efficiency is less than 90 percent. The catalyst monitor may also requires specific driving conditions before it will run. 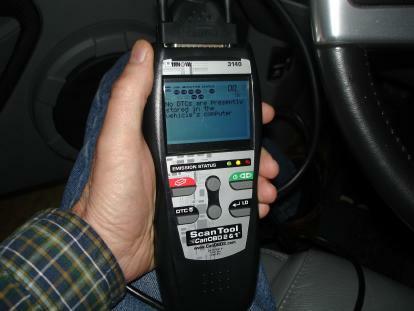 Depending on the vehicle application, this usually includes completing the HEGO (oxygen sensor) monitors first, followed by driving at highway speeds (60 to 65 mph) for at least 10 to 15 minutes under light load, no conflicts with other monitors that have not yet run (such as EVAP or EGR monitors which may have to complete before the catalyst monitor will run), and no fault codes that could affect the accuracy of the test. Some vehicles have very specific drive cycles that must be followed before the catalyst monitor will run. In some cases, it may even be necessary to complete the prescribed drive cycle several times before the catalyst monitor will run. Ford: The catalyst monitor will not run until the HEGO (oxygen sensor) monitor has run and completed successfully with no faults found. The vehicle must then be driven in stop-and-go traffic conditions at five different cruise speeds ranging from 25 to 45 mph over a period of 10 minutes. GM: The catalyst monitor runs after cruising at 55 mph for 5 minutes, but it make take up to five drive cycles at this speed before the monitor will run! Chrysler: The catalyst monitor will NOT run unless the Check Engine light is off, no fault codes are present, the fuel level is between 15 and 85 percent full, and the coolant temperature is above 70 degrees F. If these conditions have been met, the engine must have run at least 90 seconds, and the engine speed must be between 1,350 and 1,900 rpm. Idle vehicle for five minutes (to reach closed loop operation), the drive at a steady speed between 30 and 45 mph for two minutes. Toyota: The catalyst monitor will run after driving the vehicle at 40 to 55 mph for seven minutes, followed by driving at 35 to 45 mph for another seven minutes. 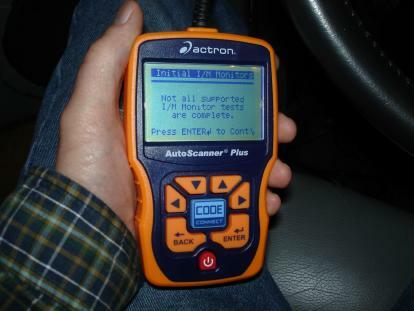 Just because a scan tool check shows no codes found doesn't mean your vehicle will pass emissions. All of the OBD monitors must also be complete for your vehicle to be test ready. On this Innova scan tool, the emissions ready status is shown with colored LED lights. GREEN means no faults and the vehicle is ready to pass. YELLOW means one or more OBD monitors have not completed and the vehicle is NOT ready for testing. RED means one or more fault codes. Repairs are needed before the vehicle will pass. Disconnecting the battery for any reason. This erases the memory in the PCM, including stored fault codes and previous OBD monitor test results. It's like resetting the clock back to zero. Consequently, it may take several days (or even weeks) of driving before all of the monitors will run, allowing your vehicle to be tested. Erasing stored codes with a scan tool. This also resets all of the monitors back to zero, so allow plenty of time for the monitors to run before driving back to the emissions test facility. If any of the erased fault codes reappear, it may prevent one or more of the monitors from completing. Disconnecting sensors. This will prevent the monitors from running and will likely set one or more fault codes. Removing the catalyst converter. This is emissions tampering and is illegal for street-driven vehicles. Installing a Performance Tune with an Aftermarket Tuner Tool. This changes the stock programming and calibration of the engine computer. Such changes are often made to increase power, change shift points, recalibrate the speedometer for different gear ratios or wheel sizes, change rev limiters and so on. Tuning modifications may also be made so the engine will run properly with aftermarket performance accessories such as a cold air intake, exhaust headers, low restriction converters or mufflers, performance camshafts and intake manifolds. But changing the programming may prevent some of the monitors from running. Some of these programs disable the downstream O2 sensors, which will prevent the catalyst monitor from running. The fix is to return the programming back to stock (which may also require temporarily removing some of the aftermarket performance parts, too!). Gaming the system by installing a "PCM simulator" to fool the emissions test station (a trick some performance enthusiasts use on highly modified vehicles in order to "pass" emissions). If you get caught, it will result in a rejection and you will probably have to undo some or all of the performance modifications you have made to your vehicle in order to pass the test. 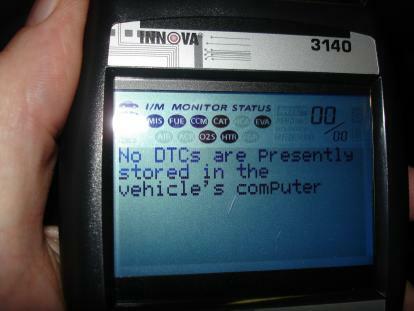 On this Innova scan tool, the OBD emissions monitor status is shown at the top of the screen. Any monitors that are flashing are NOT ready. If all of the indicators are dark, it means all have passed and the vehicle is ready for testing. 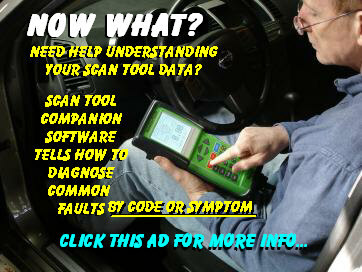 Scantool Companion software can help you diagnose your engine.